I love the surprises a normal day can bring. Last week an old acquaintance popped in the kitchen to pick up an order, a welcome surprise that caught me off guard and made me smile the rest of the day. A normal day, but sometimes it seems the normalness is what becomes dull and easy to find fault in. Then comes the tragic story of a family in SC just this week, out for a day of fun on the lake, good times to be had and memories in the making. Then tragedy strikes, husband and son are in a jet ski accident, leaving the family without a father and the a child in a coma with brain damage, fighting for his life. A normal day changed in just seconds. At a meeting last week I saw a presentation by a pretty amazing woman who has turned her tragedy into something beautiful. To honor the daughter she lost as an infant, she has started a beautiful program called Capturing Hopes Photography. Countless hours are given by photographers to the families of children with babies in the NICU. Some are not as big as your hand, or a cell phone, and the excitement of reaching the first pound is a milestone. At first I’m sure her grief was too much to bear, yet now she has started a program that helps others in her shoes, one baby, one picture at a time. It is beautiful and happening right outside our doors in Winston, check out the link, but have the tissues handy. Like her, I believe there is hope in every situation, even for the SC family now going through the worst experience of their lives. I have spent a lot of time volunteering in my life, sometimes more than I should have. You know that saying, “Stop me before I volunteer again?” That has been me many a moment. Yet, when I hear stories like the ones above, it makes me so proud of the hours I spent giving my time to Brenner Children’s Hospital and Ronald McDonald House. I think about how lucky I am that I have not needed the facility, but how many people have and what it would feel like if I were in need. What would it really be like to feel such despair, such worry, such heartbreak when it comes to your child? I hope I never know. I’ll be honest, sometimes when you are chairing an event or a committee it seems as if we are somehow a little removed from the actual cause, doesn’t it? I am here to say that all of these events, every dollar raised, every hour a volunteer gives of their time, generates hope. Hope for the family of a baby born weighing 3 ounces, hope for the child in a tragic accident rushed to the pediatric ICU. Hope. Hope Captured. There are many ways to get involved, so reach out today if you can. Brennerchildrens.org has details on “Cheers, A Toast to Children’s Health”, a fabulous event coming in April, all proceeds going to support Brenner Children’s Hospital and more information and ways to get involved with them. The Friends of Ronald McDonald House always has great events and opportunities for help, simply becoming a member of Friends support the families that stay at the house. Then there is Sport a Shirt coming in April, Character Breakfast in the Fall, Christmas Luminaries and so much more! Find out more information or join today by visiting the links above. Not to mention there are so many other places and organizations that need volunteers, our time, resources, talents, and sometimes just supplies. What tugs at your heartstrings? Babies, animals, senior citizens, the homeless, your church? Are you helping? Seconds is all it takes to change our lives. Those words alone makes these normal days wonderful, doesn’t it? Enjoy the best of food and life, each normal day at a time, with the ones you love. Have I mentioned before how much I love cookbooks? I love them. I read them. I get inspiration from them. I devour them. I will pour over a new cookbook like a good book. A cookbook given to me truly is a gift, not just a present. At Christmas this year I received Heritage, a cookbook by Sean Brock. Sean Brock, for those of you unfamiliar with him by name, is chef/owner of HUSK in Charleston, and he has been a big driving force behind part of the huge food movement that has been building there in recent years and is now making waves everywhere. He is creative to say the least, especially in utilizing the bounty of Southern foods and the history behind them. He and I share a common belief that a large part of cooking is part of your growing up, part of who you are, your heritage. For me there have been several influences, but as I read his words I simply could not stop picturing my grandmother, Ruby, in her frilly apron over her small kitchen stove flipping fried chicken, or dropping biscuit dough into a pot of chicken and dumplings, turning squash fritters, and checking to be sure “the boys” were washing up for Sunday dinner. She in turn influenced my mom, who always prepared dinner, who influenced me, and I hope the trend will continue from here. He writes something clever in the front of his cookbook called “My Manifesto” and it has some awesome words I wanted to share with my readers. It is lengthy and I am going to choose my favorites, but you are welcome to borrow the full version anytime. Cook with soul-but first, get to know your soul. Be proud of your roots, be proud of your home, be proud of your family and its culture. That’s your inspiration. Cook in the moment. Cook the way you are feeling, cook to suit the weather, cook with your mood, or to change your mood. Listen to your tongue, it’s smart. Heritage. Where we come from, what we are taught, traditions. Cherish yours, and the best food and life has to offer when we will open our eyes, and ears, and hearts, and soak it in. Enjoy, the best of food and life. What do you think of when I say mushroom? Do you think of fresh chanterelles sautéed in garlic herb butter, served warm over toasted brioche? Maybe you think of Carl, the mushroom man who purveys his gorgeous shitakes at our local farmers markets. Or, perhaps you aren’t a mushroom lover at all, and you think of having to pick mushrooms out of many dishes. However, when I say mushroom, I think of one of the greatest culinary influences I have ever known, and am overwhelmed with memories. Let me explain. I was fresh out of college and spending my second season in Wyoming working on a dude ranch. My best friend and other girls my age were cleaning cabins, while the boys were pretending to be cowboys. I, however, was having the time of my life in my first professional kitchen. 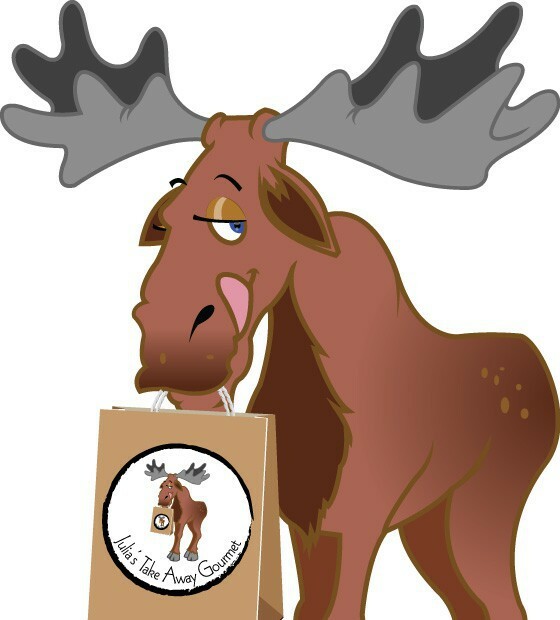 I will pause here and say that this is another blog for another time, but let’s summarize by saying my experience in the Moose Head kitchen taught me as much as any fine culinary school education ever would have. My mentor, kitchen boss, and friend, was a chef named Steve. In the off season Steve travelled the culinary extremes of the world, and he loved to share what he had learned. One day Steve asked if I would like to go out to harvest wild morel mushrooms. I am the adventurous type (so I’ve been told), and I immediately thought it sounded like fun and literally dug right in. I can still picture picking that first morel, covered in spongy holes and smelling as musty as the Aspen forest floor growing by the Snake River. I can remember the thrill of preparing them in a decadent sauce to be served with lamb, just to us first, just in case the nearly identical and toxic twin had been chosen instead. From harvesting to preparing them it is a special memory, and one I will never forget. Recently I was reminded of this experience day after day as I grew my own Oyster mushrooms. 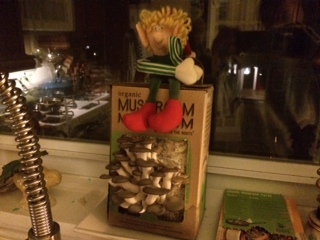 I was sent a mushroom farm, the cute kind in a box that you grow in your home, perched in a windowsill for the family to enjoy. I was thrilled! I was a little skeptical that it could produce the same gorgeous oyster mushrooms as pictured in just 10 days, but it really did. Whole Foods sells this kit, made by Back to the Roots, and it was so much fun I wish I had bought them for everyone for Christmas gifts. Simply sautéed for a salad or omelette, this type of horticulture is made for all! 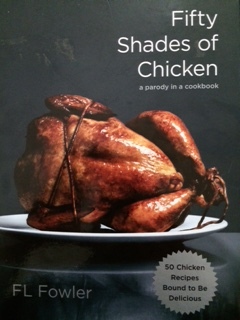 It would make a fabulous Valentine’s Day gift for the foodie in your life, hint hint! So here I am now, a mere twenty years later in my Southern kitchen instead of Western kitchens, growing mushrooms in a windowsill, and I couldn’t be happier with the paths my life has taken. There are days when I close my eyes and imagine I am still out West, more than anyone can imagine. But when I open my eyes, really open my eyes to all the greatness around me, all is good. Sometimes the little things, the little memories, can simply mean so much. Enjoy the best of food and life, and sweet memories. Listed below are some links to Whole Foods recipes I thought sounded enticing to try using mushrooms…. The older I get the more Thanksgiving becomes my favorite holiday. When I was younger, Thanksgiving was all about being out of school, getting the most crisp turkey skin, and watching the Macy’s Day Parade in my pajama’s. Now that I am no longer in school or quite so young, Thanksgiving fills me with a sense of happiness and gratitude as I celebrate these traditions with my own family. Contentment, that’s the word I would choose. Contentment, what a good place to be. So here’s a Thanksgiving wish to all for a wonderful Holiday week ahead. I hope your time spent with family and friends is wonderful, and of course accompanied by delicious food. More importantly, I hope you stuff yourself full of joy, thankfulness, gratitude, contentment, and love. Enjoy the best of food and life, with thanks for all we have. Knock, knock, who’s there? This sounds like a joke, but I am not kidding when I say today is already October 30th and November is just two days away. It is hard to believe how quickly Fall comes to our doors. Didn’t school just start yesterday? I swear I haven’t even put away our pool bag from the summer yet. Never the less, Halloween is here tomorrow, which means Thanksgiving is just around the corner. I adore this time of year and it has been so much fun seeing so many of you at the kitchen the day before Thanksgiving the past two years. Last year there were snow flurries in the air, and it couldn’t have felt more like a Holiday if I had been plopped down in a Norman Rockwell painting. As I anticipate the month ahead, I know you are doing the same and making your plans. So, news flash, my Thanksgiving dishes to help you out for 2014 are now listed on the side link under “For the Holiday Dinner table”, or just click here. Thanksgiving orders must be placed by Noon, November 19th. Quantities are limited, so please be sure to get your orders in sooner than later. Menu items listed under “For the dinner table” may be prepared in your serving dishes, please inquire. Pick up for these orders will be Wednesday, November 26th, time to be announced. As hard as it is to be thankful when that rude person breaks in front of you at Thruway and steals your parking space, remember we are all just human. As we hurry around with our errands, our “to do” lists, shopping lists, and so much more, be sure to take time and remember why you are doing all of this. It is thanks giving, giving thanks for all we have in our lives. Family, friends, a roof over our heads, and food on our tables. Enjoy each moment, the best of our lives, savor each day. Lyrics, timeless and beautiful. It would be hard to discern if the quote above is from a 2013 One Direction album, a hit from the fifties or sixties, or something else. I am not sure of the date, but I can tell you it is from a hymn by composer John Rutter. A few weeks ago my daughter, who is in choir for the first time, sang in the church service with the “big” choir. This was the hymn they performed. I probably don’t need to tell you I had tears in my eyes. Without quoting it all, the song goes on to talk about our world and blessings, a poignant reminder how fortunate we are. Often, we need this reminder. Every time I turn on the news it seems full of stories of death, disease, politics, and in one word, despair. Yes, ISIS and Ebola are certainly very important news of the day. However, I’m beginning to think having a busy schedule that makes staying up to date on current events a challenge, really isn’t such a bad thing after all. I mean, if there is really something I need to know, I am certain my phone will start chiming and I will quickly be brought up to speed. I am so ready for the November election to be here so I can stop listening to Kay Hagan and Tom Tillis bash each other, I might be the first one in the voting line. Ok, exaggeration right there, but you know what I mean. Is too much news a bad thing, or a good thing? When does sensationalism begin, or end? Call me ignorant if you like, but I prefer sensational days over sensational news. A nice glass of wine with a good meal, enjoyed with family or good friends, and if it’s really sensational enjoyed with both family and friends. The simple things, like reading a new Halloween book to the kids at night, decorating with pumpkins, the simple things that make my days bountiful, enriched, meaningful…sensational. The funny thing is, sensational things are always around us, we just have to look for them, or allow them. Sometimes we just have to stop, and realize it is in front of our eyes. Enjoy, the best of food and life, and the sensational moments all around.